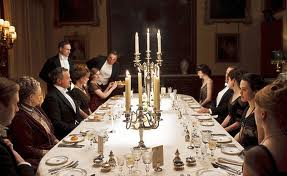 It would be great fun to have a dinner party like on Downton Abbey. Well, it would be fun if someone else does the actual work of cooking, serving, and tidying up to 13 courses (over a wood burning stove, no less!) Oh, the lady of the house was occupied with planning the menu, sorting the seating arrangements, and most importantly, finding just the right dress and jewels for the occasion. It also fell to her to ensure her guests were comfortable, well-partnered, and that conversation never faltered. 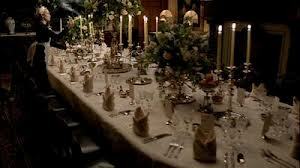 Often, a dinner party had ulterior motives: business or political gain for the lord of the manor, or social maneuvering for one of the daughters of the house. A dinner party showcased the wealth and power of the family (the silver and crystal on display, the important personages seated at the table) and solidified the social clout of the hostess. A disastrous evening damaged not only her own reputation, but that of her husband and could even harm her daughter’s chances of an eligible match. Let’s pretend we have no ulterior motives beyond a fun evening, that we have scads of servants (all well paid, and unswervingly loyal to the family, of course) to do all the heavy lifting, and that money is no object when it comes to dishes or diamonds. During our daily meeting with the housekeeper and the cook, we inform them of the delightful news. They relish a challenge and will do The Family proud. Cook has suggestions for the menu, knowing what is in season and available locally. We barter a little, because though this is to be a light-hearted affair, there is a certain young gentleman in the neighbourhood we have an eye on for our eldest girl, and know he is particularly fond of asparagus. Invitations are carefully written in our elegant penmanship, franked by Sir Husband (a stamp was not required if a Lord of the Realm, signed – franked - the front of a letter; otherwise the recipient would pay to receive the letter) and dispatched through the mail, which was delivered three times a day. Four couples and two gentlemen are expected. Our two eldest daughters, who have made their debut, bring our number to 14. Perfect! Any more and we’d have to extend the table. Provisions are made with the housekeeper for the grooms and any other servants that may arrive with the invited guests. Our imposing butler is informed of the upcoming festivity, along with the menu and wine selection so he can ensure the table is well laid, the silver is polished, and the cellar adequately stocked. The gardener is consulted so we can be sure to have fresh and abundant arrangements for the occasion, and the stables are alerted so they are prepared to cope with the influx of horses, grooms, and carriages. Now we come to the fun of it all: selecting the perfect gown for the evening. Briefly we consider having a new dress made up from the lengths of silk we brought from London… but, no. This is meant to be an informal affair after all. 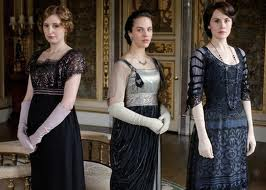 Sir Husband is already grumbling at the expense of dressing two daughters just embarking on their first seasons – the social whirl of London society – despite the plumpness of our coffers. Best keep the new dress for an occasion where it can make an impact. Besides, there are the emeralds from Christmas we have not yet worn…. We settle on a beautiful black lace dress laid over a dark blue silk underdress. The emeralds at neck and ears along with a few well-placed diamonds in the hair will make for a lovely effect. The days pass, and while cook despairs of having asparagus and peaches, our gardens and greenhouses are up to the challenge. Vases are full, fresh candles in place, cigars ready for the gentlemen, kitchen staff in a flurry and upper servants at the ready; the dressing gong sounds. Family members prepare, lady’s maids and valet scurrying from room to room with finishing touches. At last, the sound of carriage wheels is heard approaching up the long drive to the front doors. We gather in the salon to await our guests. They leave their coats and cloaks with the footmen in the hall before being escorted to our door, where they are announced by the butler. An experienced hostess, we assess our guests, pleased at the balance of personalities and interests represented in the group. 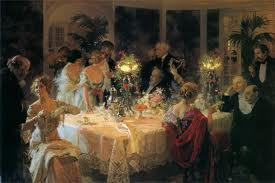 There is a happy atmosphere in the room, and all assembled seem willing to enjoy their evening. We signal the butler, who announces that dinner is served. We perform our duties as hostess by pairing each gentleman with the lady he is to partner for dinner (husband and wife never sit together) being careful to not step on any toes of rank. Sir Husband leads the highest ranking lady in to the dining room and we all follow in order of decreasing precedence. The meal goes without a fault. The footmen are impeccable in their serve of the dishes, the asparagus are greatly appreciated by the young gentleman who smiled at our daughter, and conversation flows as smoothly and enjoyably as the wine. 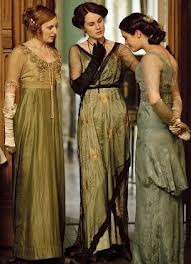 Once the last peach has been eaten, we signal, and the ladies leave the men to their cigars and Port and talk of horses and estate management. We gather in the salon to chatter about neighbourhood news and the latest dress designs. Having been admonished to not linger over the empty table or to retreat to the billiards room, it isn’t long before the gentlemen join us. They look so handsome and refined in their starched shirts and impeccably tailored black jackets. Their very presence in the room enlivened the ladies to sparkle in demeanor and conversation. Coffee is poured out, several of the ladies play on the piano, and a few hands of whist are dealt out. 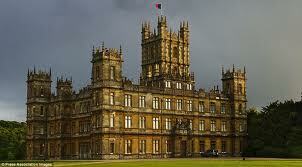 Far too soon, it seems, our guests gather back in the hall, wrapped again in coats or cloaks as we await the carriages to be brought round from the stables. Merry voices call out their thanks and farewells… and among them a tender goodbye whispered to one particular pair of ears and two sets of hands linger before slowly parting, fingers outstretched to maintain contact. A benevolent (and well-pleased) parent observes, and is content. So beautifully written. Ahhh....but a more beautiful time indeed.